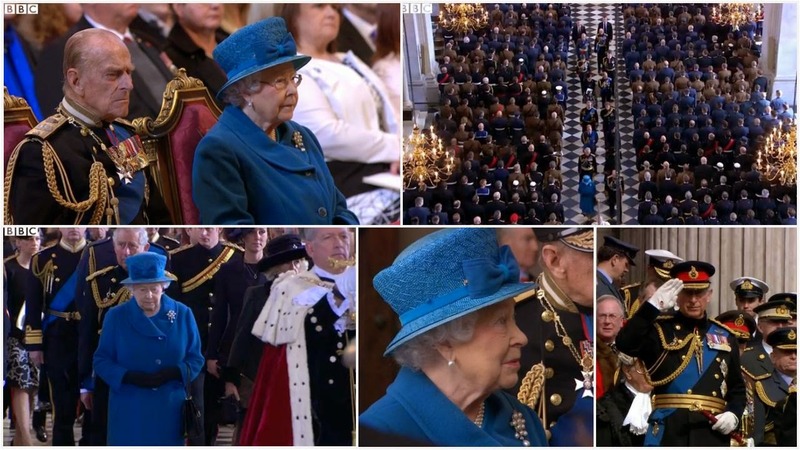 The Queen, accompanied by The Duke of Edinburgh and other members of the Royal Family, attended a Service of Commemoration at St. Paul's Cathedral to mark the end of British combat operations in Afghanistan and in remembrance of those who lost their lives in the conflict. I like days when the major members of the family turn out in their very best, uniforms included, and I'm glad this event in particular brought that out. I'm also very glad to see Her Majesty heading up the royal contingent, after initial doubt regarding her attendance. It wouldn't have felt right for her not to head up this group. Queen Victoria's 11 Pearl Brooch, left to the Crown by Victoria herself, seems a suitably important and large piece for the occasion. The Queen does get in the habit of repeating certain brooches with certain outfits, and this is a combo we've seen previously. The Duke of Edinburgh was very dashing in his fancy Admiral of the Fleet naval dress uniform, (adorably) offering a helping hand to his wife as they made their way down the steps of St. Paul's. The Prince of Wales wore his Field Marshal's Army uniform, and The Duchess has a uniform of her own, a coat made for military engagements in its styling and particularly in its buttons, which bear the emblem of The Rifles. Camilla is the Royal Colonel of the 4th Battalion, and she also has their badge perched on her hat. The Duke of Cambridge wore his RAF uniform, and The Duchess of Cambridge coordinated with his blues in a very elegant new navy coat from Beulah London with her navy hat and gorgeous chignon. Kate was also sporting some new jewelry, a pendant and earrings made from inverted pear-shaped tanzanite stones surrounded by diamonds and set in platinum. These pieces come from G. Collins and Sons, personal jewelers to The Queen and home of the former Crown Jeweler (pendant here, similar earrings here; identification per the My Small Obsessions Facebook). A lovely shade of purple-y blue in these stones, and a really nice choice for this outfit. Prince Harry wore the dress uniform of the Household Cavalry. Harry is of course an Afghanistan vet himself, and his medals include one from the Afghanistan campaign. The Duke of York was in his naval dress uniform and The Earl of Wessex wore the dress uniform of the Royal Wessex Yeomanry, of which he is Royal Honorary Colonel. The Countess of Wessex wore a new black and white Oscar de la Renta dress with a full skirt and asymmetrical hemline (identification per the Countess of Wessex blog) under a short black jacket with a Jane Taylor hat. I love the use of a print to liven up a plain black outfit, and concentrating the black on top made it a great canvas for her own special touch: a Rifles badge, similar to Camilla's. Sophie is the Royal Colonel of the 5th Battalion. The Princess Royal was at her best (as always) in her dress uniform from the Blues and Royals, of which she is Colonel. Her husband, Vice Admiral Sir Tim Laurence, was another member of the family in a naval dress uniform. And two more members of the uniform crew to finish us out, The Dukes of Kent and Gloucester, in (respectively) Army and RAF uniforms.